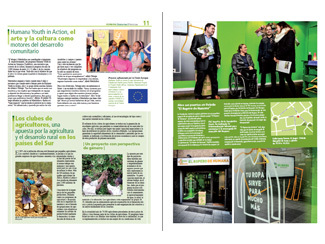 This week begins the distribution of 'Humana News Asturias ' newsletter which includes news, experiences and testimonials about the Humana's work in Asturias . Environment, cooperation for developmnet, job creation, social farming and social welfare activities are the main issues of this publication. A total of 15,000 copies have been printed 12,000 will be distributed here by Friday byte in Avilés , Oviedo and Gijón, 600 were handed out last Sunday at the football match between Real Oviedo and Real Avilés, the rest are available in 'El Ropero de Humana'. The 'Humana News' was created with the intention of being a means to interact and communicate news about the Foundation donors textile used as well as institutions and private entities that collaborate with the entity. 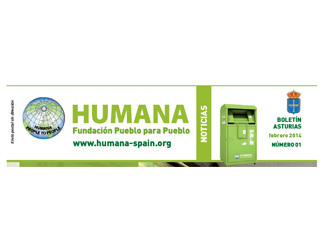 Want to be also a tool to disseminate the initiatives and projects we do in Asturias and to acknowledge the support and trust that citizens and employees in the work deposited Humana develops in the community.